The only way we've been able to liberate cities from ISIS is to demolish them. 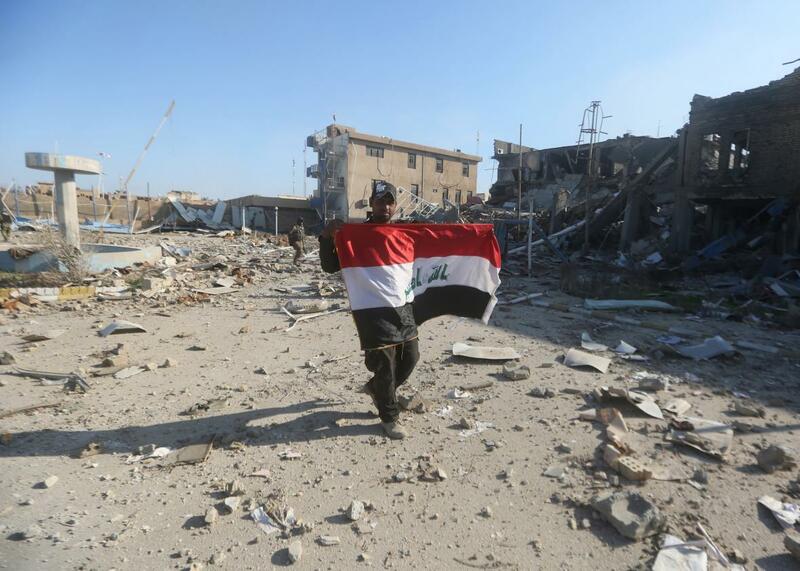 A member of the Iraqi security forces holds his national flag on Dec. 28, 2015, at the heavily damaged government complex after they recaptured the city of Ramadi. In 1968, following the heavy U.S. bombing of the Viet Cong–held city of Ben Tre, the Associated Press’ Peter Arnett quoted an anonymous U.S. major saying, “it became necessary to destroy the town to save it.” Though some have disputed the veracity of the quote, it became one of the iconic utterances of the Vietnam War, symbolizing the U.S. military’s indifference to civilian casualties. Many streets had been erased or remained covered in rubble or blocked by trenches used in the fighting. To reach their command center in the city’s southwest, Iraqi forces took a meandering, bumpy dirt track through neighborhoods full of collapsed homes, shrapnel-ridden shop fronts and swimming-pool-size craters left by airstrikes. One was full of green water, apparently from a damaged sewage line. Over half the city was destroyed, officials say. Entire blocks are pancake flattened, as if an earthquake had struck. Even in quieter areas, no building seems to have escaped unscathed – those still standing are missing windows, doors, whole sections of walls, scorched black by fire or looted during the fighting. The pattern is now pretty clear. When ISIS is on the verge of losing a city, its fighters dig in with booby traps, IEDs, and suicide bombers to slow down the final assault by ground troops. This forces the coalition to rely heavily on U.S. airstrikes, which only increases the destruction of buildings and civilian casualties. Amid criticism back home, U.S. commanders have been anxious to tout progress in reclaiming territory from ISIS and promise breakthroughs soon in major ISIS-held cities like Mosul. But given that it seems necessary to destroy these cities in order to liberate them, these victories feel pretty hollow.